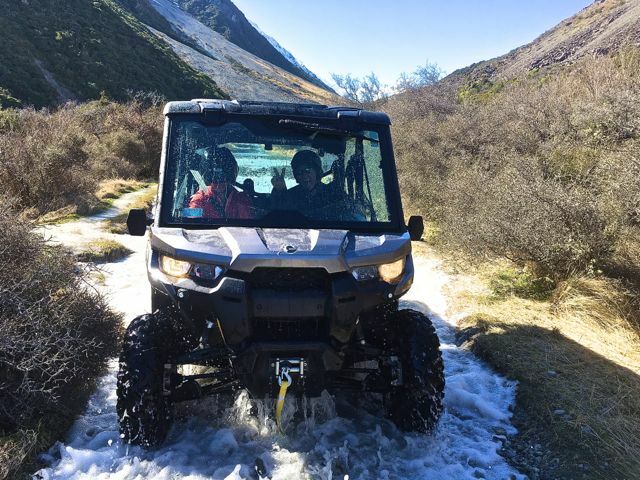 Join us and escape the crowds for a fun trip up the famous Tasman Glacier Valley. 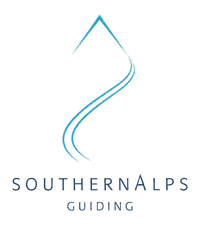 Follow the famous route taken by the first explorers on their journey into the heart of the Southern Alps. Your guides are seasoned mountain people with years of mountain guiding and taking care of clients to the highest safety standards. Our trip begins with a full safety briefing and gear check. 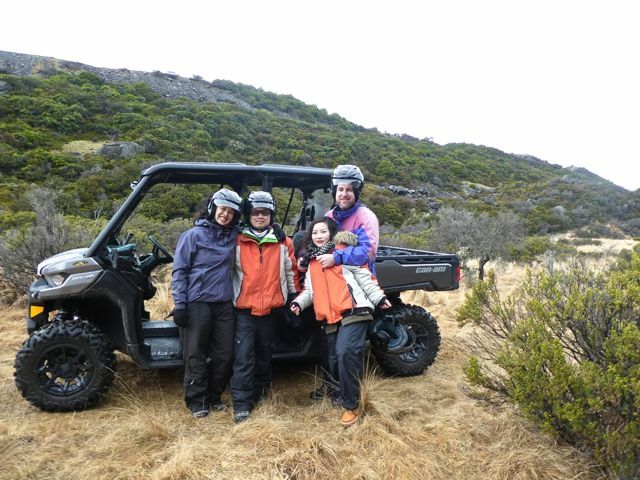 Equipped and ready for our adventure we head up the Tasman Valley road and then up the famous old Ball Hut Road in our 4WD Can-Am vehicle. It's a terrific drive and very exciting. Driving through water troughs with the water splashing over the top of the Can-Am. Your guide will stop at certain points along the way and go over lots of the history and points of interest. 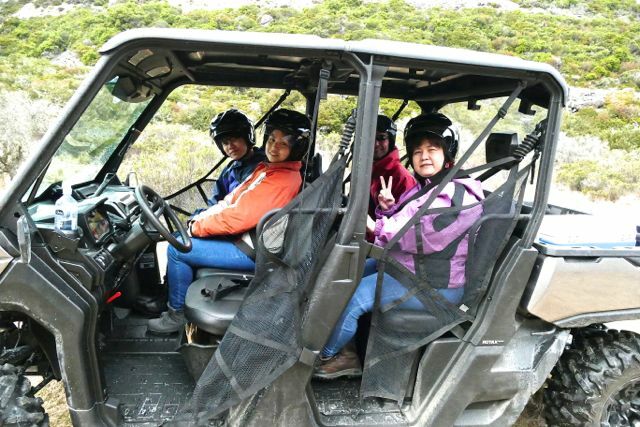 Also the guide will show you our native flora and fauna. 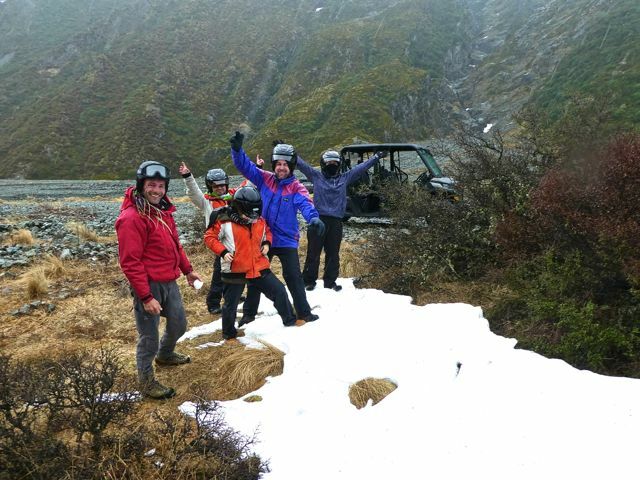 The exciting 4WD journey takes us into the Tasman Glacier Valley where our short treks begin. 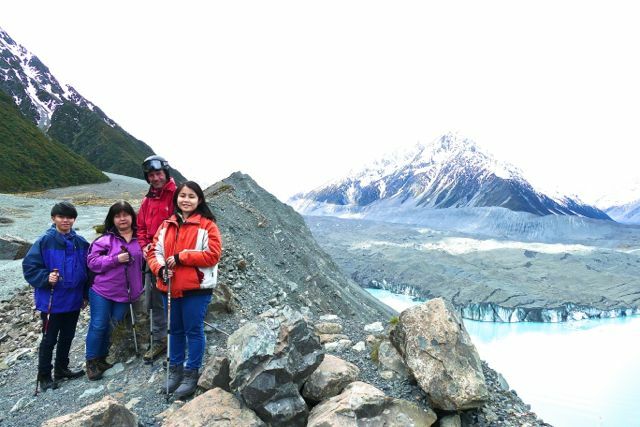 We trek to the top of the Tasman Glacier moraine wall which gives us spectacular views of the Southern Alps. 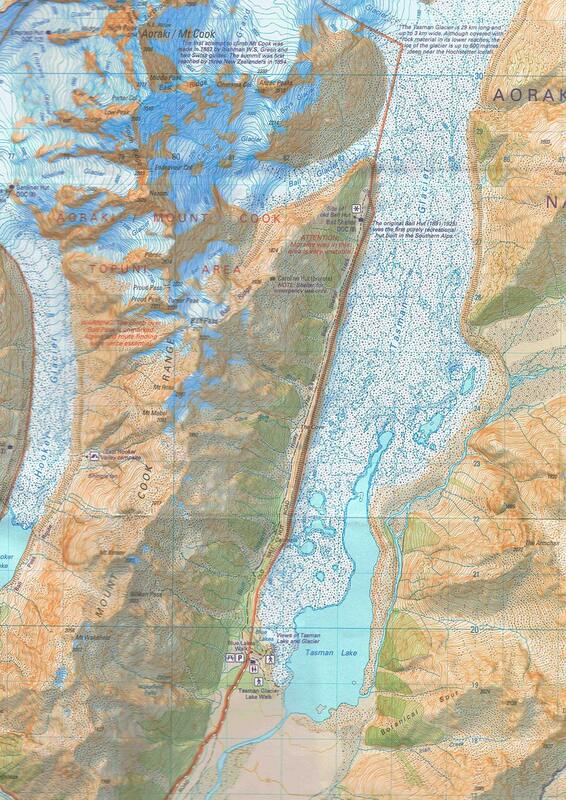 The highlight of the trek is viewing the Tasman Glacier Terminal Face. 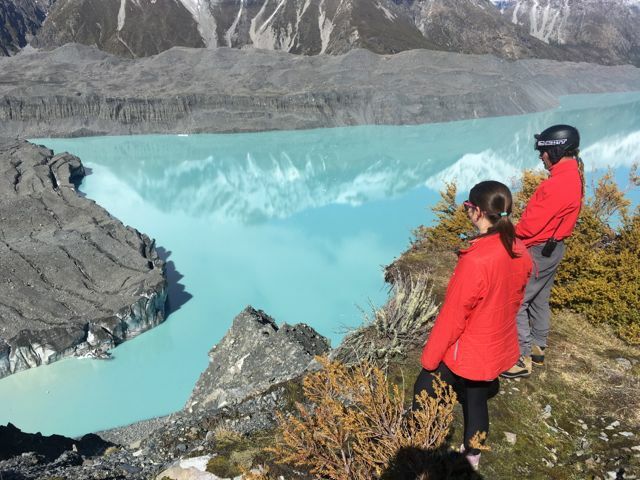 This is where the mighty Tasman Glacier finishes and meets the glacier lake. At times impressive glacier calvings can be witnessed and this produces the ice bergs that plunge into the lake. 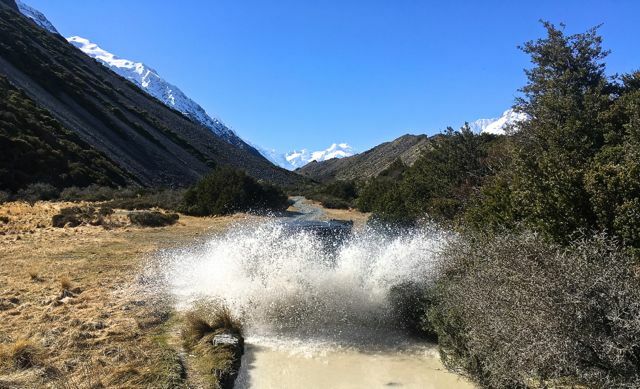 There is an abundance of native flora in the Tasman Valley and your guide will show you the many species including the famous Mt Cook Lily when in season. We’ll stop in a scenic location for a delicious lunch and refreshments which are provided. This is an ever-changing environment, so there is no guarantee that specific features will be seen. Minimum number 2. Maximum 5. We meet at The Old Mountaineers’ Café Bar, next door to the DOC Visitor Centre at.10.00am. In high season there is a trip at 3.30pm as well. COST: NZ$150 per person. Families welcome. Minimum number of 2 maximum 5 people. Price includes: Guide fees, vehicle transport, DOC permit fees, walking pole, a relaxing picnic in the valley with a hot drink and GST. You should bring good walking shoes/boots, warm clothing, windproof jacket, sun protection and a camera. We can provide any gear if you need it. TRIP DURATION: Approximately three hours. ABILITY: Easy. 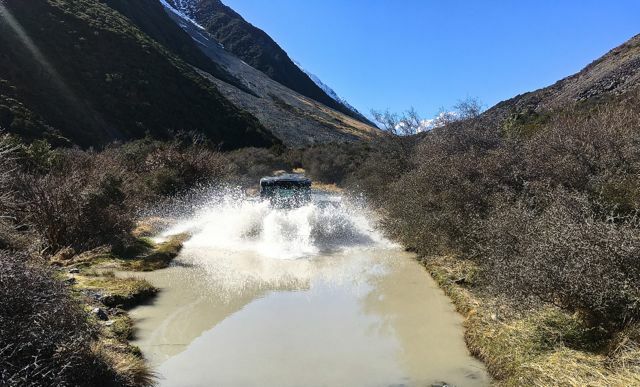 “Southern Alps Guiding Ltd works with the Department of Conservation (DOC) to ensure that our impact on New Zealand's National Parks and reserves is minimal.